I hate my wavy hair and have been getting my hair chemically straightened for a bunch of years now and I recently got it straightened again. Last year, the straightening made my hair amazingly soft and silky but I did not take care of it at all and the effect wore out in a few months. 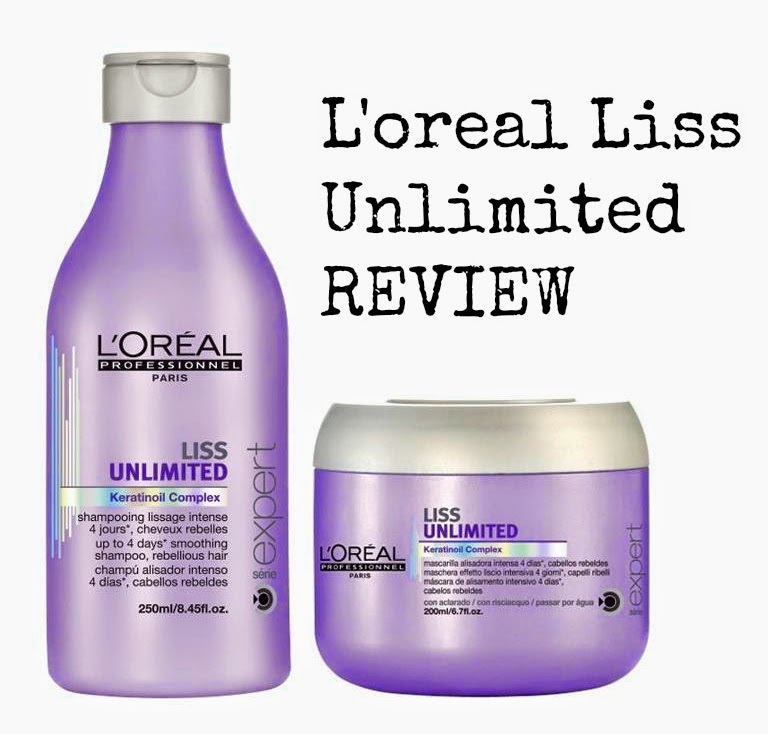 So this time I've decided to start taking care of my hair and pamper it with L'oreal's Liss Unlimited range. Ideal for rebellious hair, this range introduces a complete haircare regime to control even the most unruly of locks. With summer in full blast, I was looking at a product which delivers long-lasting smooth and straight results that is uninterrupted by heat and humidity and this range does exactly that. A key factor of climate-proof hair care range is its use of Keratinoil Complex – a dual system technology which combines a gel formula with Pro-Keratin for strength and control, and an oil formula with Kukui and Evening Primrose oils to block humidity. Pro-Keratin that helps repair the your hair’s internal structure, making it feel stronger and more resilient while Kukui Nut defends dry, rebellious hair from the threat of humidity and Evening Primrose smoothens, nourishes and help banish seasonal woes so you know your hairstyle going to be safe in the upcoming monsoon too! I shampoo my hair every alternate day thanks to the summer heat and to maintain a smooth and high gloss finish, I use the smoothing shampoo and masque each time. The shampoo is incredibly moisturizing and a little bit goes a long way. If you like your head to feel squeaky clean like me (especially after a sweaty gym session), I recommend you to use a cleansing shampoo first and then use this one to soften your locks. After shampooing, I use the masque and leave it on for about 3-5 minutes. The masque has a lovely fragrance and its thick creamy texture helps effectively seals in moisture in your hair shaft and leaves hair looking exceptionally shiny. The finished result is incredibly smooth hair that feels like silk, yet still has the movement and freedom of unfinished hair. See my hair below to see its effect. Pretty shiny and healthy looking for chemically straightened and highlighted right? L'oreal Liss Unlimited shampoo and masque really help me with this! If you're looking at a moisturizing shampoo and conditioner system which will leave your hair soft, shiny and humidity proof, this is the product to choose! I totally recommend this range to all my readers! Available in all major salons worldwide. Have you tried this range? What's your favorite shampoo and conditioner/masque duo? Tell me in your comments below! Your hair looks like silk, magnifique!! Your hair after this shampoo and masque look so shiny . Have u colored your hair too !! This sounds amazing - and your hair looks fantastic! Great product to make your lovely hair look beautiful. June, you have such a healthy lush looking hair....you're doing a fab job taking care of it for sure:) I've never seen this L'Oreal line here before, but I do like L'Oreal in general. Thank you for inspiration. Where can I get L'oreal's Liss Unlimited range . I have never seen this line. This sounds awesome! I almost bought that masque the last time I was at the store. I really like their sulfate-free collection! I get the one with the red caps. I haven't tried this range, but it sounds great! Your hair looks great after the treatment. Product appears to do its job well. Thanks for stopping by. Wow, your hair are so beautiful and healty! Good job dear! I love the light on your hair!!!! Great review. I have tried some of L'oreal products but not this one, will have to check it out. Thx for sharing. Your hair is gorgeous!! Great review. Here's the link so you could follow me easily! FOLLOW THE SLIM KID INSIDE, HERE! Thanks for a helpful post, you look beautiful. Hi beautiful June, your hair is amazing!!!! Love L'oreal and those products. wow after seeing how healthy your hair looks makes me want to have it too! is it available in Belgium? What do you think of my latest post ? would love to hear your thoughts on it! Your hair looks so beautifully shiny and glossy, sounds like a good range. Thanks for sharing your opinion with me, I completely agree with you. Wishing you a warm and wonderful weekend! Very inspiring and beautiful post dear! great job! Your hair is beautiful. Kisses! Oh very good product! i love it LÓreal is perfect for my hair! Your hair looks beautiful and so shiny. I'm going to keep my eyes peeled for this, it looks amazing! Great post, thanks for sharing! I am also your newest follower!! Thanks a lot for your review dear June! Without this helpful review I had never tried this :) And your hair is beautiful, you know this? I have chemically straightner my hair so which shampoo is best in loreal? Please suggest. Does this range reduce hairfall?? ?